The Jewels of the Deccan tour is offered by The Deccan Odyssey, one of the finest luxury trains in India that lets you visit the famous UNESCO World Heritage Sites, architectural marvels, historical sites and a lot of enjoyment. The tour takes you to Bijapur, where you visit several monuments belonging to the Deccan Sultanate like the Jumma Masjid (one of the oldest mosques in India) and Malik-e-Maidan (largest medieval cannon in the world). At Aihole, you visit the famous 70 rock cut temples whose style varies from each other, while at Badami, you get to admire the rock-cut caves. 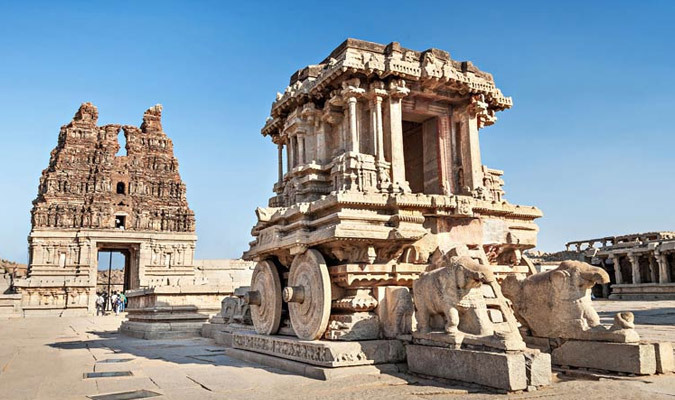 The tour then takes you to Hampi, where you get to visit the Virupaksha Temple, Vittala Temple and other attractions. 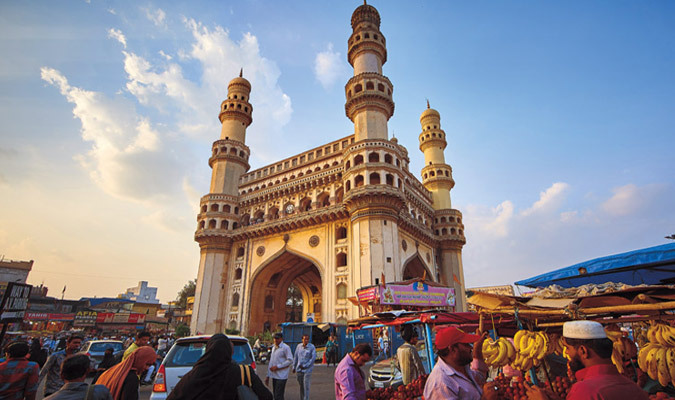 In Hyderabad, you can visit the famous Charminar and its famous biryani. The tour also covers Ajanta and Ellora caves, whose marvelous sculptures will leave you completely enchanted. Guests gather in Chhatrapati Shivaji Terminus around 1530 hours and complete all the formalities related to check-in and registration. 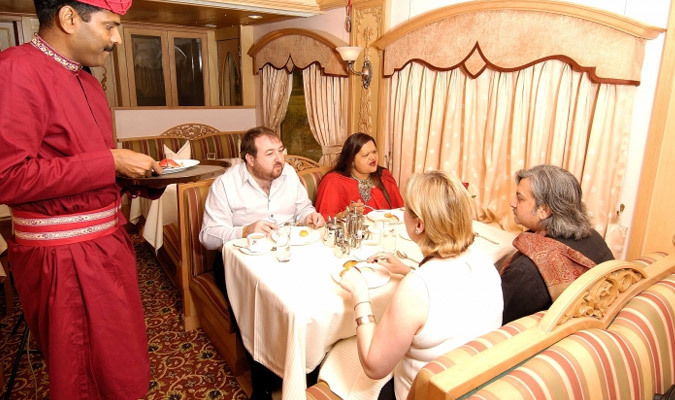 This is followed by a traditional welcome onboard the luxury train accompanied by a welcome drink. Settle in your delightful cabin as the train chugs off for its first destination, Bijapur (Karnataka). Dinner is served onboard. Stay overnight in Deccan Odyssey. You are served scrumptious breakfast onboard as the train arrives in Bijapur, which served as the capital of Sultans of Deccan in the erstwhile era. Though in the 10th or 11th century, Bijapur was established by the Kalyani Chalukyas, but it came under the rule of different sultanates as the time changed. Between the period of 16th and 17th century, Adil Shahi Dynasty made Bijapur his capital too. Owing to secular nature of the ruler, many poets, scholars, poets, dancers, musicians, Sufi saints and other artists came to Bijapur, which was also known as 'Palmyra of the Deccan'. Have your breakfast and proceed for sightseeing. The first attraction is Gol Gumbaz (round dome), the mausoleum of Adil Shah (Sultan of Bijapur). This is an architectural marvel because of its two aspects; One- it is the second largest tomb in the world and Two, the circular gallery is where even the tiniest whispers echo and get magnified. Next, visit the Jumma Masjid, followed by Malik-e-Maidan. Jumma Masjid is one of the oldest mosques of India and Malik-e-Maidan is the largest medieval cannon in the world. As per the legends go, if someone touches the gun and asks for a wish to be fulfilled, it gets granted. Then, head to Mehtar Mahal, which is an ornate gateway dating back to 17th century. Next in line is Ibrahim Rouza, one of the most beautiful Islamic monuments of the country. People believe that its 24-meter-high minaret inspired the creation of Taj Mahal, the Seventh Wonder of the World. Return to the comforts of Deccan Odyssey in the afternoon. The lunch is served as the train leaves for Aihole & Pattadakal. 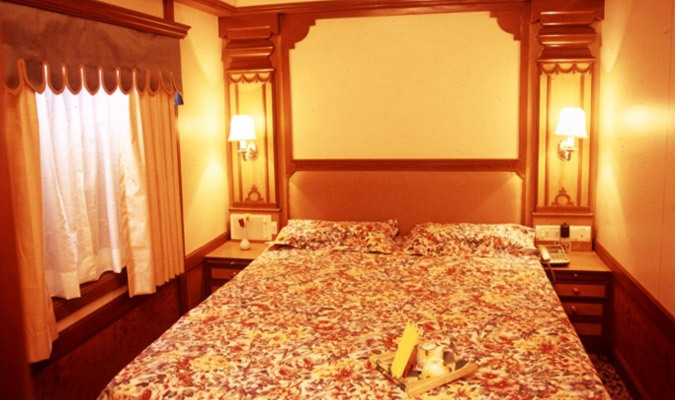 Spend the evening availing the amenities offered onboard- such as spa, lounge, indoor games etc. Welcome to the cradle of history and legends, to the ancient settlements of Aihole & Pattadakal, one of world's largest temple complexes. The Chalukyan rulers commissioned the construction of more than 70 rock-cut temples. These temples have their own style and differ entirely from each other, even with any other temples of the country. This is perhaps the reason why Aihole is often called the Cradle of Indian Architecture. After Aihole, visit Pattadakal, which is settled on the Malaprabha River bank. The architectural style represented here is a blend of North Indian (Nagara) and South Indian (Dravidian) styles. If we believe what historians say, the architecture of Pattadakal inspired Hoysala and other dynasties in the past. Return to the Deccan Odyssey for lunch. After this, you have a choice of visiting the weaving village of Guldegud. The village is known for its hand and power looms of khan and ilkal. You can spend your time observing the weaving process and collect some souvenirs from the outlet. 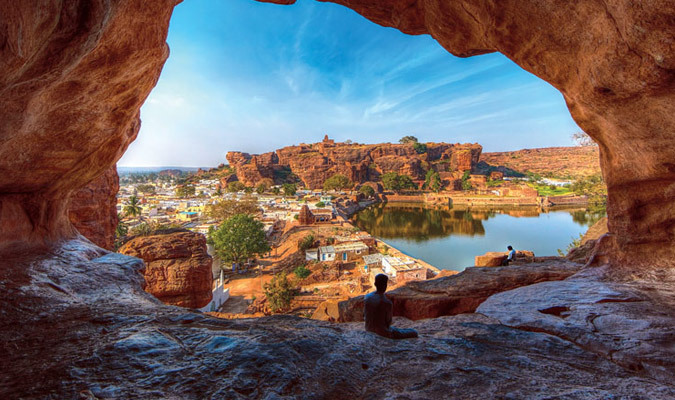 Another option is visiting the historic city of Badami, which features rock-cut caves and sculptured temples. Dinner is served onboard as the train chugs off for Hampi. Overnight stay in Deccan Odyssey. The train arrives in Hospet in the morning and the guests are served breakfast onboard. Prepare to visit the ancient city of Hampi, a UNESCO World Heritage Site known for its brilliant architecture, legends and sculptures. This little historic town isn't too far away from city, but looks world apart. Clicking pictures near the Narasimha Statue is a common activity here. As you reach, just explore the town. Next site for the day is Mustard Ganesh at the base of Hemkuta Hills. Behold the beautiful vista and stroll along the banks of Tungabhadra River and explore Virupaksha Temple. 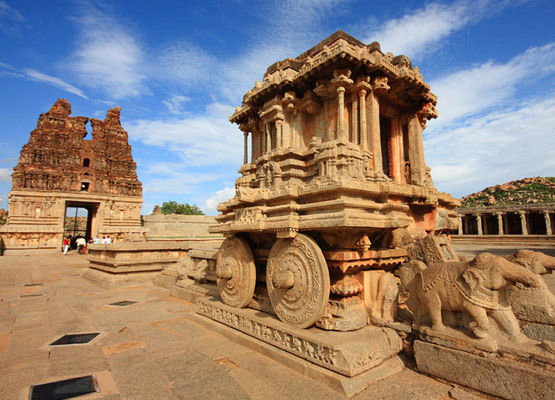 Later, head to Vittalla Temple, a very popular temple of South India flaunting a splendid intricate architecture, which is renowned also for its stone chariot. Return to Hospet and board Deccan Odyssey as the Lunch gets served onboard. Exploration isn't ceased as yet. De-board the train and head towards Royal Center at Hampi. Since it served as the citadel of Vijaynagara Empire, you can spot various courtly structures. Some of its many attractions are- the Stepped Tank, Hazararama Tank, the Queen's Enclosure, the Mahanavami Dibba and Elephants' Stable. After this fun-filled day return to the Hospet Station and hop aboard. Dinner is served as the train leaves for Hyderabad. Overnight stay in Deccan Odyssey. 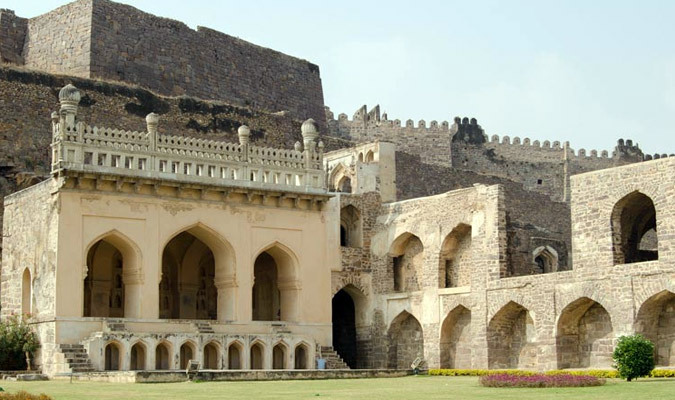 The City of Nizams, Hyderabad is scheduled to be visited on the fifth day of the Jewels of the Deccan tour. The city traded pearls and diamonds in the erstwhile era and is still known as City of Pearls. Qutb Shahi Dynasty, Mughals or British, Hyderabad's history and heritage define it mainly. There are many legends associated with the christening of the city; one such legend says that the city is named after the wife of Muhammad Quli Qutb Shah, who was a Hindu and converted into Islam and was named Hyder Mahal. Visit Golconda after scrumptious breakfast aboard the luxury train. The region is famed for the mines that have produced some of the most popular gems of the world- including Hope Diamond, Nassak Diamond and even Koh-i-noor Diamond. The Golconda Fort is another of its major attractions, which alone covers an area of 11 km. If not Golconda, you can choose to go for a shopping tour in the local markets of Hyderabad. Some of the best buys here include- pearl, ittar (oil-based fragrances) and lac bangles. For lunch savor Hyderabad's world-famous biriyani. Afterwards, proceed to Falaknuma Palace, which literally means Like the Sky and it has been named so owing to its sky-soaring heights. The tour to this palace is followed by a relaxing high-tea session. A visit to Hyderabad is considered incomplete without exploring the area of Charminar, which is bustling and lively. Charminar is saved as the last attraction of the day. The Monument and Mosque was built by Muhammad Quli Qutb Shah in 1591 CE. Today, this stands as an icon of Hyderabad and is one of the most popular monuments of India. It is surrounded with bustling Laad Bazaar, with its specialty being bangles and ornaments. If you are looking for Hyderabad's popular Deccan Pearls head to Pather Gatti. Return to the comforts of luxury train. Dinner is served onboard as the train chugs off for Aurangabad. Overnight stay in Deccan Odyssey. Welcome to Aurangabad on the sixth day of your Jewels of the Deccan Tour. Aurangabad is named after the great Mughal Ruler Aurangzeb. Many sites such as Bibi-ka-Makbara and city's 52 gates represent Mughal charm. As the train reaches Aurangabad, guests have their breakfast and then head to explore the popular Ellora Caves. The Ellora Caves is a UNESCO World Heritage Site and comprises of 34 rock-cut shrines dating back to the period between 4th and 5th century AD. As a whole there are 17 Hindu shrines, 12 caves dedicated to Buddhism and 5 Jain shrines. One of its prime attractions is Kailash Temple, which is believed to be representing Mount Kailash, the Adobe of Lord Shiva. Return aboard and savor lunch and cocktail. In the meanwhile, the train chugs off towards its next destination, Jalgaon for Ajanta Caves. In the evening, indulge in any of the many recreational amenities available onboard, such as spa. Dinner and overnight stay in Deccan Odyssey. The Deccan Odyssey today arrives in Jalgaon, from where guests deboard for Ajanta Caves, after breakfast. The Ajanta Caves is a popular tourist attraction of India and a UNESCO World Heritage Site, consisting of 30 rock-hewn Buddhist caves. These caves are not merely acclaimed for its spiritual significance but also for the intricacy of the carvings, precision of sculptures, beauty of paintings that together reflect the blend of Buddhist and Hindu art. Return to the Deccan Odyssey for lunch and then disembark to visit Mahatma Gandhi Memorial. Mahatma Gandhi wasn't just an Indian freedom fighter, but his thoughts like non-violence have inspired people worldwide. He is also known as Father of the Nation. In the evening, return onboard and sip sun-downer and behold the landscape before you unfold. Dinner and overnight stay onboard. The eighth day of your Jewels of Deccan Tour marks the end of the beautiful journey. The train stations at Chhatrapati Shivaji Terminus, Mumbai. Guests have their breakfast and then bid farewell. Become a shopaholic getting indulge in traditional markets.